Rolling Rock has the right to acquire a 50% working interest in and to certain leases, hydrocarbons, wells, agreements, equipment, surface rights agreements and assignable permits totaling approximately 101,888 acres (160 sections) at an 80% net revenue interest located in the Mancos formation in the Southern Uinta Basin, Utah. Rolling Rock Resource is a wholly-owned subsidiary of Fortem Resources, which has the right to acquire 75% working interest in and to certain leases, hydrocarbons, wells, agreements, equipment, surface rights and assignable permits totaling approximately 131,032 acres (205 sections) at an 80% net revenue interest located in the Mancos formation in the Southern Uinta Basin, Utah. The Mancos property is a proven producing shallow oil shale resource play and its acreage sits in the peak oil maturity window of the Southern Uinta Basin. Multiple vertical penetrations have produced up to 120,000 bbls, which confirms commercial resource presence. The property is drill-ready with shallow to medium depths for low findings and reasonable development costs. Other deeper formations like the Granite Wash/Arkose are present and could make for a very interesting play with potentially larger oil in place to accompany the Mancos formation. Three Federal exploratory units have been formed under Mancos Flats, Windy Mesa and Grand Mancos. There are currently 17 legacy wells producing oil and gas with a 75-mile natural gas gathering lines, a gas processing facility and two compressor stations. The Mancos shale is stratigraphically equivalent to the Niobrara Formation in Northeast Colorado, as well as the Eagle Ford Formation in South Texas (among two of the largest unconventional shale resources plays in the world). 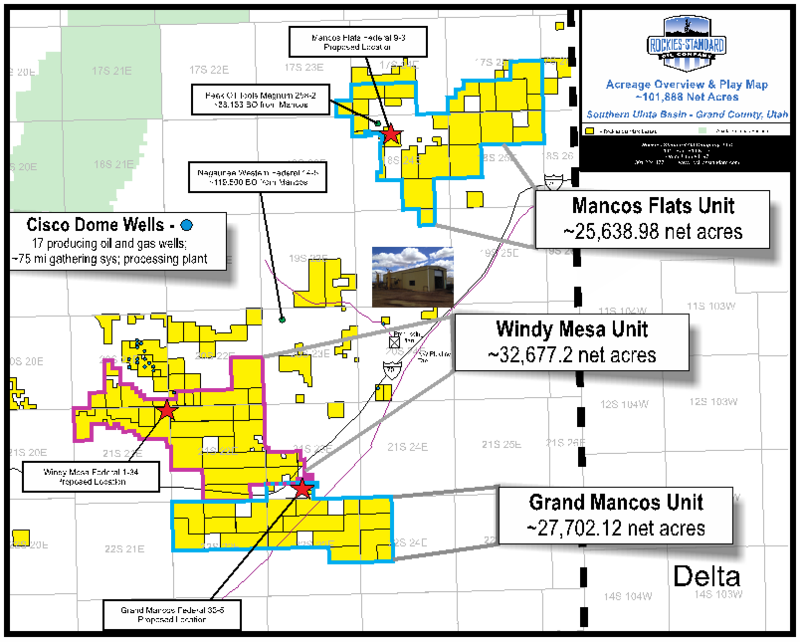 Mancos formation is also being developed south of Rolling Rocks leases in the San Jan Basin, New Mexico, where WPX Energy has drilled 100+ horizontal wells, producing over 30,000 barrels of oil per day. The company intends to have Deloitte perform a NI 51-101 evaluation report in the near future. This will ultimately enhance the company Market Capitalization.